This year-long course offers an experience in working with clay as an artistic medium. Students will investigate various hand building techniques as well as working with the potter’s wheel. Students study the ceramic process as well as explore the historical and scientific aspects of clay. The emphasis will be on creating vessels in the first semester. The second semester will begin with an introduction to figurative sculpture. Students will incorporate art history through an in-depth study of the history of American ceramics, as well as contemporary art. Studio work is the emphasis of this class. One museum visit and report is required for each semester. There is a lab fee that covers unlimited clay and glaze for the entire year. This course follows Ceramics I and is designed for the student who wants to develop hand building and wheel throwing techniques at an advanced level. More in-depth projects and studio problems will challenge the student’s knowledge of various techniques. Studio work is essential to this class. In addition, students will be invited to participate in an Art Outreach project with a local elementary or middle school, teaching a lesson in clay sculpture. One museum visit is required each semester. There is a lab fee that covers unlimited clay and glaze for the entire year. This program was developed to offer our most advanced art students an opportunity to teach the techniques and skills they have learned at MC to younger students at the local elementary and middle schools. 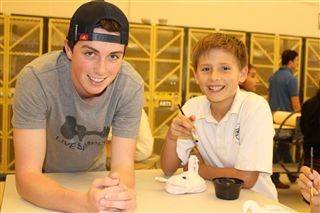 Our students work independently with a particular class and school to accomplish an art project. We provide all of the materials and instruction at no cost to the lower level schools so that we can help enhance and enrich their arts curriculum. Our goal is to empower those younger students with more experience in art and hopefully more confidence in themselves. Similarly, we hope to empower our advanced students through this experience of teaching the material they have learned at MC. We have worked with a variety of schools, public and private, and are always open to more collaborations. E-mail Mark Jaeger at mjaeger@marincatholic.org with any questions or requests.